Tom Katers hosts a fun series of podcasts reviewing Silver & Bronze Age comics. He started with “Tom vs. the JLA”, covering each issue of the original Justice League of America run, issue-by-issue. Once he’d covered all those issues, he moved on to “Tom vs. the Flash”, and most recently “Tom vs. Aquaman”. Each episode Tom covers a single issue, delivering a summary in which he celebrates the Silver/Bronze Age story-tropes. Oh yeah, he’s damn funny too. While doing the “Tom vs. the Flash” series of podcasts, he touched on the Firestorm back-up stories. While he wasn’t always kind to Firestorm’s adventures, he certainly was hilarious to listen to. I highly recommend you give these podcasts a try! You can find “Tom vs. the Flash” on iTunes, his Libsyn page, and his blog. Be sure to check out the podcasts that cover the Firestorm back-up stories in The Flash #289 – #304. Fun stuff! 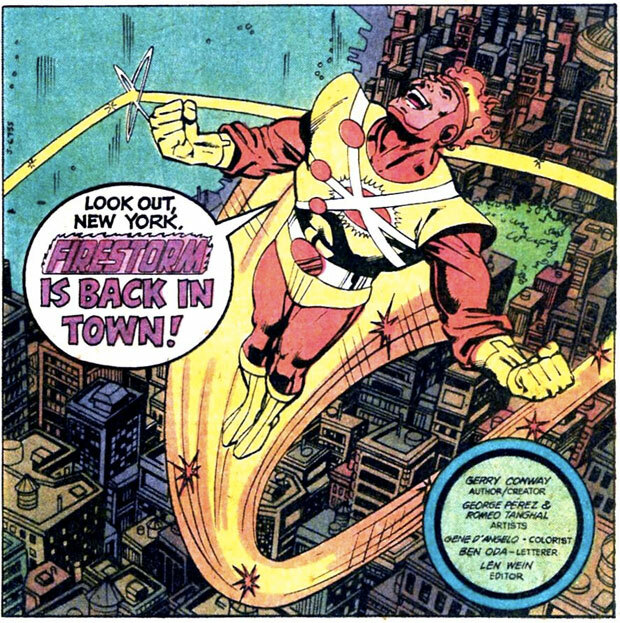 If you enjoy those, you may wish to go back and listen to his “Tom vs. the JLA” episodes that covered Firestorm-centric issues, such as Justice League of America #179 & #180. Support Firestorm (and Tom Katers)! Fan the flame! Posted in: Firestorm #01: Original (Ronnie/Martin), Flash back-up stories. I have a long trip coming up….I think I just found my entertainment! Thanks for the heads up! Felicity Smoak is coming to Arrow. Will Ronnie Raymond be next?